Vice Ganda's Movie "Praybeyt Benjamin" has surpassed that of "No Other Woman," making it the highest-earning Pinoy film in history. Actress-host Kris Aquino first revealed the news on her show earlier today. Actor DJ Durano, who stars in the comedy flick, also tweeted that their movie has reached the P300 million mark. "Congrats sa Praybeyt Benjamin!!! Casts!!! Tayo na ang Highest grossing film of all time:) let's go! 300M congrats! @vicegandako ikaw na!!" Durano posted on Twitter. On "Showtime," Vice Ganda was congratulated by his co-hosts after announcing about his movie's big achievement. Via his Twitter account, Vice thanked the "madlang people" for supporting his movie. "Maraming salamat Madlang People sa pagmamahal nyo! Wala ng paglagyan ang kasiyahan ko! Salamat po talaga! Lord, ikaw ang unkabogable!" Vice tweeted. 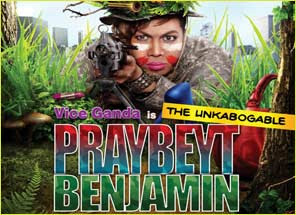 It was earlier reported that "Praybeyt Benjamin" earned P200 million in ticket sales in eight days which allowed it to become the most successful Filipino movie during its first week in theaters. Topbilled by Vice Ganda, "Praybeyt Benjamin" tells the story of a gay man born into a military family is forced to enlist in place of his ailing father when a civil war breaks out in the Philippines. Its star-studded cast include Derek Ramsay, Eddie Garcia, Jimmy Santos, Carlos Agassi, Nikki Valdez, Kean Cipriano, DJ Durano, Vandolph Quizon, and Dennis Padilla.